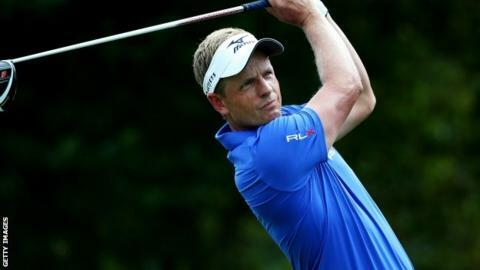 England's former world number one Luke Donald lies two shots off the lead at the halfway point of the Sony Open in Honolulu after a second-round 65. Leader Brandt Snedeker, who had a share of the lead after the opening round, is on 12 under par - one clear of fellow American Kevin Kisner. Donald, five under par for the day, is 10 under, level with Americans Zach Johnson, Zac Blair and Chez Reavie. Snedeker was third at last week's Tournament of Champions in Hawaii. His short game helped him take the lead on day two as he holed out from 15 foot on his first hole, chipped in from 35 feet on his 12th, and then had a 20-footer at the next on the way to match Donald's five-under-par round of 65. "This is why we spend so much time away from our families as well as so much time on the golf course - to be in contention and have a chance to win at the weekend," he said. Fiji's Vijay Singh, 52, who is hoping to become the oldest winner on the PGA Tour, is four off the lead after a one-under round of 69. Singh had shared the early lead with Snedeker, Kisner, Ricky Barnes and Morgan Hoffman after the quintet all hit 63s in their first round. Padraig Harrington and England's Greg Owen are in a group six off the pace on six under but Northern Ireland's Graeme McDowell missed the cut by six shots on three over after a 73 on Friday.